Wilde was known for his sparkling and naughty wit, but his children’s stories have a poignant tone and Christian themes. Oscar Wilde’s fairytale of a statue and a swallow is both beautiful and sad. The statue was once a happy prince with no idea that others could be sad. 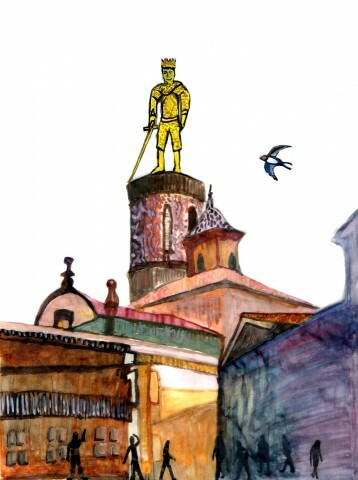 Now that he is a statue, high above the city, he can see that his happiness is not shared by all. A longer story with a moral message – perhaps connected to Easter. Oscar Wilde’s witty tale about a rocket who is convinced that he is by far the most remarkable firework in the pack.